Dr. Schillinger sees new patients and established patients all day on Mondays, Wednesdays and Fridays. On Tuesdays and Thursdays, he works privately with patients providing stress management therapy, life coaching and nutritional counseling. However, if there is a "new patient emergency" on a Tuesday or Thursday, he will do his best to make room in his schedule to accommodate you. 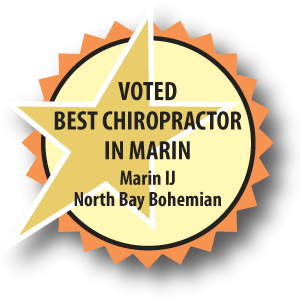 We are always in the office on these days, so please give us a call at (415) 491-0959 if you need to be seen. The first visit is the longest, because Dr. Schillinger is very thorough in his consultation and examination. This initial visit is 30 minutes. and is only performed at the first visit. Each treatment with Dr. Schillinger takes between 10 – 20 minutes. If you were also treated on the first visit, the total time would be approximately 45 minutes. At the end of the first treatment, Dr. Schillinger will give you instructions for home care, so that you can improve the likelihood of feeling improvement immediately. His recommendations may include simple stretching exercises, natural remedies or conventional ("over the counter") medications. This visit is known as the "Report of Findings". Dr. Schillinger will spend 10 minutes reviewing his exam findings from your first visit, so that you can really understand you're the cause of your symptoms. He'll then explain how his treatment recommendations can help you feel better as quickly as possible. With the addition of the 10 – 20 minutes of treatment, the total time for the second visit is approximately 30 minutes. Are X-Rays or MRI's Necessary? Dr. Schillinger does not routinely takes x-rays, or order MRI's for new patients. After 31 years in practice, he's confident in his abilities to help patients without these tests. However, he does occasionally recommend additional testing if the patient's condition warrants it. If these tests are absolutely necessary, he will discuss this with you to get your feedback and, together, you and he will plan the way forward. What Happens in Follow Up Office Visits? Each treatment is directed towards the immediate relief of your current symptoms and a complete correction of your underlying problems. Your care may include chiropractic adjustments, stress – reduction techniques, exercise instruction, physiotherapy or deep tissue massage therapy. Dr. Schillinger performs periodic re-assessments to monitor your response to his care. As you continue to improve, the frequency of your care diminishes. When patients are symptom – free because their condition has been corrected, they're invited to receive prevention, or wellness treatments a few times each year. Those patients who are pro-active and elect to receive this pain – free level of care, often experience better sleep, improved digestion, less mental anxiety and more energy.